Southwest...The Little Quadrant That Could: More Residential for Waterfront Station? Since PUD approval for the two Waterfront Station vacant sites at the intersection of 4th and M streets are nearing expiration, Forest City Washington is seeking a two-year extension. The two-year extension may not be necessary if they get approval for a revision to their plans. Even though the two vacant sites were planned as office buildings, about 600 more apartment units may be built instead. David Smith from Forest City Washington made the company’s intention known at tonight’s ANC 6D meeting to revise their PUD to allow residential development. The change was made because office market conditions are currently not favorable in the area and the anticipation is that won't change anytime soon. This isn’t the first time one of the Waterfront Station sites changed uses. The Eliot on 4th apartment building was originally planned as office, but switched to residential for the same reason. 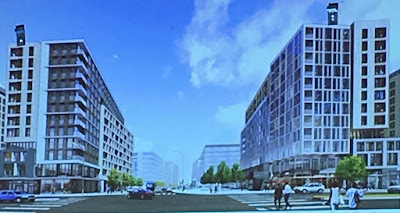 The switch in use from office to residential would result in no changes to density or height approved in the original PUD, but the design by Perkins Eastman scales down the height of the buildings along 4th Street to match 1100 and 1101 4th Street, which opened in 2010. Each building would be C-shaped with an elevated courtyard space facing M Street and have a green roof. Development plans are still preliminary, but the two proposed residential buildings would each have 17,500 SF of ground floor retail and 17,500 SF of office space on the second floor. The retail and office space would be along M Street and 4th Street. Above the two-level commercial base would be the rental apartment towers. 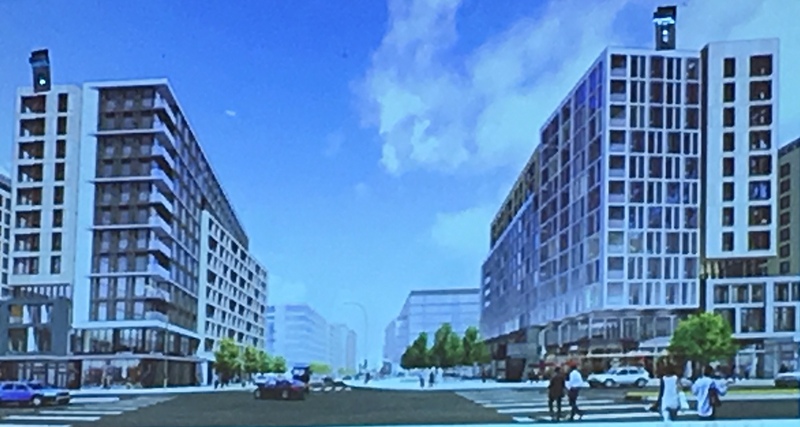 Entrances to the residential buildings would be on the north side on 4th Street while the entrances to the office space would be on M Street. About 8% of the units will be set aside as affordable to residents earning up to 60% of AMI and some of the units would include 2BR and 3BR units to accommodate families. Forest City intends to file their modification to the PUD in about two weeks.